Hi! This is Eve Mayberger with an update on the Ancient Panel Painting: Examination, Analysis, and Research (APPEAR) project (see earlier post here). 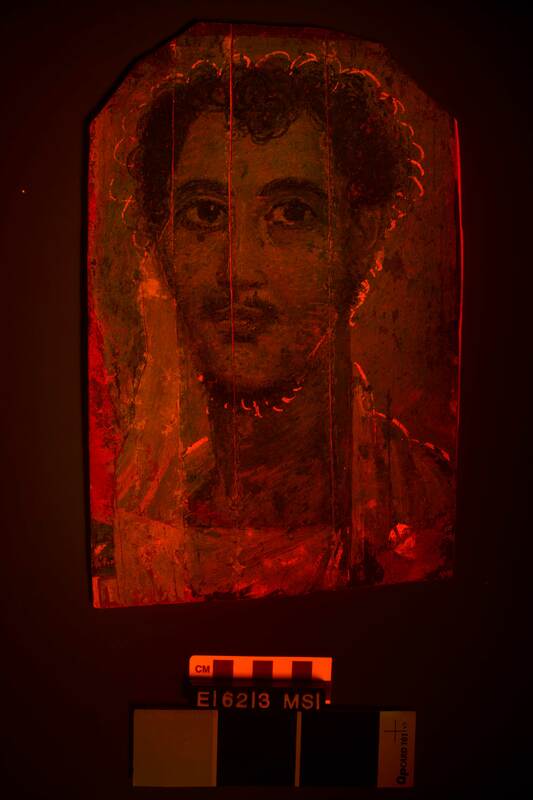 I am happy to report that I have completed multispectral imaging (MSI) for the three Fayum mummy portraits. The In the Artifact Lab blog has talked about MSI in several previous posts here and here. MSI is a helpful technique that uses specific frequencies across the electromagnetic spectrum to differentiate and sometimes identify materials. Although I took full sets of MSI images for all three mummy portraits, I am only going to share a few images of the Portrait of a Young Man (E16213) which proved particularly interesting. The first step of MSI imaging is to take a normal visible light photo using a modified digital camera and appropriate filters. The object and camera setup must remain unchanged throughout the entire process. Only the light source and camera filters change. APPEAR Project, Portrait of a Young Man (E16213) Ultraviolet visible fluorescence (UVF). Captured with a Nikon D5200, modified by replacing the hot mirror filter with a glass custom full spectrum filter, B+W UV-IR cut filter (#486 MRC), and SPEX Mini CrimeScope 300-400 nm light source. The ultraviolet visible fluorescence (UVF) image confirms that the wooden panel has been previously repaired. The restored area has a different fluorescence than the surrounding wood (see annotation). I had noticed that the paint in this area was handled differently and noted that it could be a later addition. The UVF image supports this idea. APPEAR Project, Portrait of a Young Man (E16213) Visible-induced visible luminescence (VIVL) image. Captured with a Nikon D5200, modified by replacing the hot mirror filter with a glass custom full spectrum filter, B+W UV-IR cut filter (#486 MRC), Tiffen red camera filter (23A), and SPEX Mini CrimeScope 535 nm light source. The most unexpected observation was seen in the visible-induced visible luminescence (VIVL) image captured with a 535 nm light source. The filter gives the image the overall red coloring. Notice that the outline of the figure has been etched into the paint. This demarcation of space was completely undetected under other light sources. 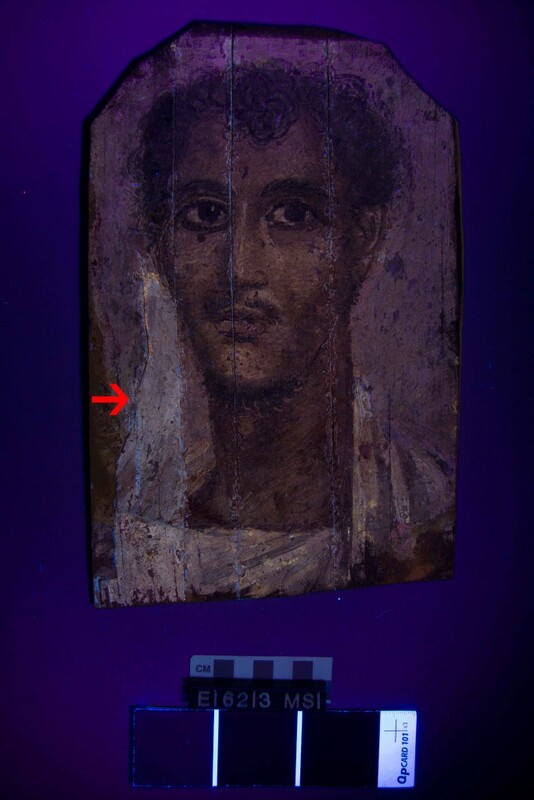 This technique was not observed on the other two mummy portraits (E16212 and E16214) at the Penn Museum. I am curious to see if other institutions participating in the APPEAR project have portraits with hidden outlines around their figures. 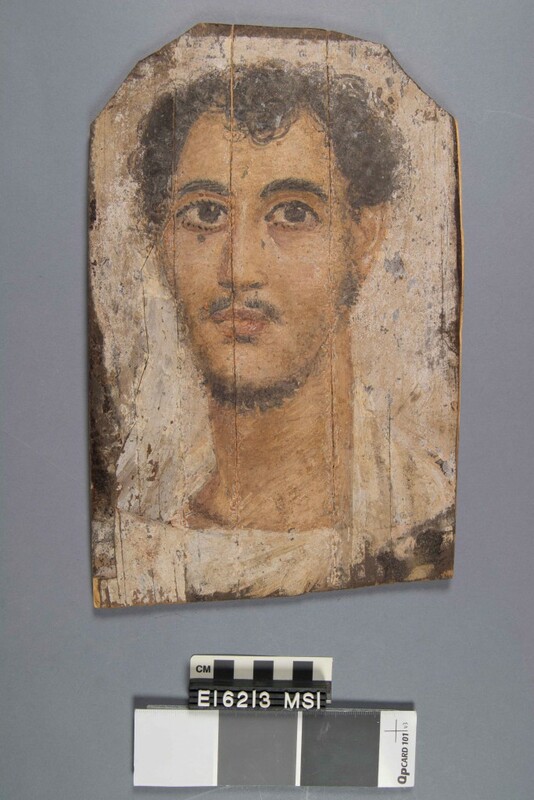 This entry was posted in analysis, examination, imaging, Objects In the Artifact Lab and tagged APPEAR Project, Encaustic painting, Examination, Fayum mummy portraits, multispectral imaging by mollygleeson. Bookmark the permalink.